The site title can only be changed for project sites. Site titles for course sites cannot be changed. 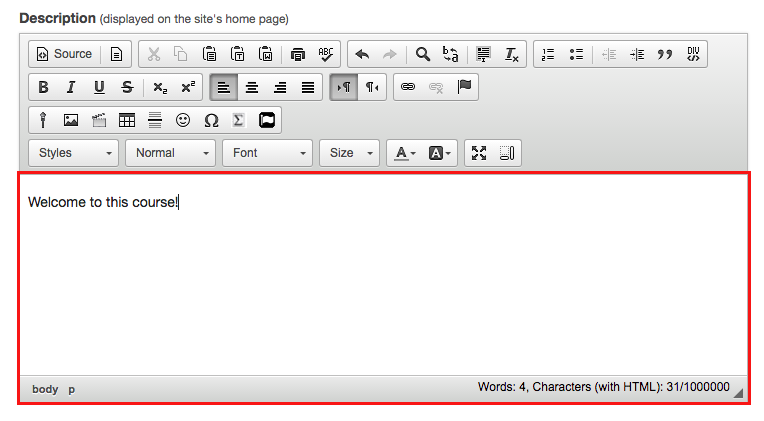 If desired, you can change the default language for your site to any of the available languages listed. Languages in this list will vary depending on the language pack(s) installed on your instance. The information entered into the description area will appear on the site's OVERVIEW. You may use the Rich Text Editor here to enter your description. OWL can display LaTeX equations as mathematical notation in most tools. Using LaTeX options, instructors and students can simply write LaTeX in an enabled tool and the resulting equation will be displayed beautifully. Go to the SITE INFO tool in the tool menu of your site. Click the Edit Site Information button. 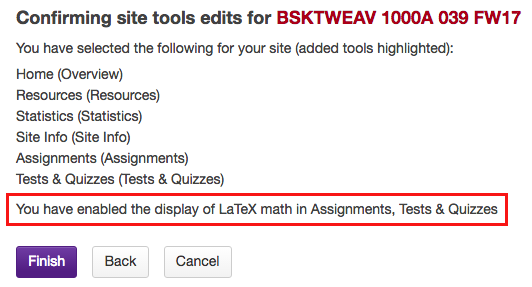 Select "Allow the display of LaTeX math in this site." Click Continue. Scroll to the bottom of the "Edit Site Information" screen to find the checkbox to enable the LaTeX language for the site. Then click Continue. 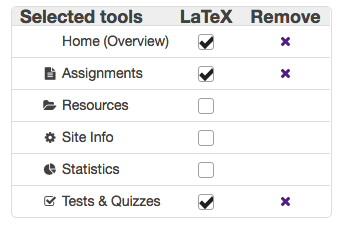 Click Finish to confirm the addition of LaTeX to the course site. From "Site Info" button menu, select "Manage Tools". This opens "Course Site Tools" screen. Check LaTeX box next to tool names to enable. Use "Selected Tools" list (upper right-hand side of "Course Site Tools" screen) to check boxes for all tools in which you want to use LaTeX equations. The confirmation screen displays tools for which LaTeX has been enabled. Click Finish to confirm. Enter LaTeX equation in the rich text editor of selected tools. Insert "$$" before and after mathematical equation to set it apart from the rest of the text. Math equations are editable in the edit screen of the tool, but will display as an equation in preview and student view. Equation displays as expected in student view.